Since the First World War, as the opening titles tell us (rather oddly misplaced, by the way, right before “Warner Bros. Pictures Presents…”; surely it could have gone after… but we’re getting sidetracked), dogs have been used by military forces to help sniff out bombs, sense danger from opposing forces, and just in general help them out in their never-ending conflict for peace. Making a movie that wants to salute those brave canines that fought on our side, and the great work that they and their trainers can do in some of the most dangerous war zones in history, is a wonderful idea that can bring to light a whole other side of war that is definitely worth exploring, for both animal lovers and fanatics of all things conflict. Max, however, isn’t and shouldn’t be the archetype for that ideal movie. The only time it actually dives into what it should dive into is the beginning and the ending, with the latter consisting of a montage of photos featuring the dogs in question throughout history. Sandwiched in between them, however, is the corniest and most clichéd of 90s-era boy-and-animal stories that is for some reason made fifteen years after that decade expired – and even then, it can’t keep that tone consistent (but we’ll get to that). 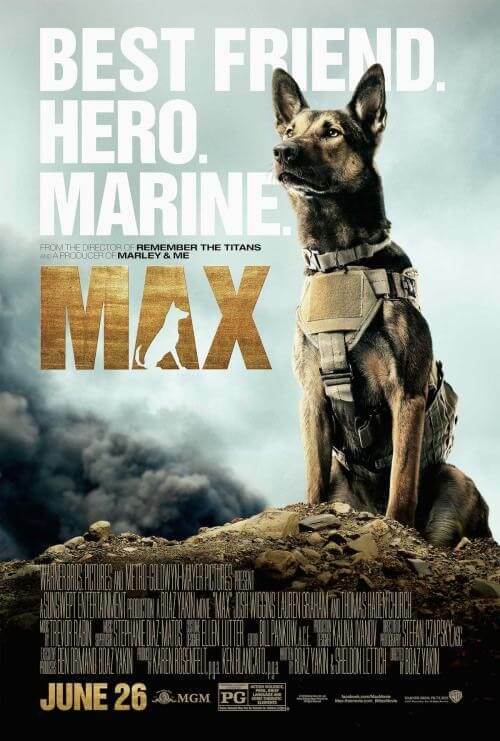 The opening sees our hero, the war dog Max, patrolling with a group of US Marines in Afghanistan, and it’s here where we actually get a hint of what this movie should have really been about: the actual dogs in action. When it’s focusing on that, it’s fairly decent (if a little corny) and keeps the investment going. However, it’s not long before that goes to waste: his handler is killed in action, which sees Max being transported back to American soil and adopted by the handler’s family, including his younger brother Justin (Josh Wiggins), and from there… well, it’s quite difficult to explain. Not that it’s necessarily complicated (though it certainly can be), but that it quite literally turns into at least two different movies all vying for attention in a completely different one. The whole “war hero” movie seems to be over and done with far too quickly in its opening, and when the “boy-befriends-wild-animal” film kicks in so does the “coming-of-age teen romance” movie, the “kids-go-on-an-adventure-with-an-animal” movie and, most bizarrely of all, the “action-orientated gun smuggling thriller” movie. Oh yeah, THAT’s a thing that clearly belongs in this movie about a boy and his war dog; a sinister and surprisingly harsh movie that the likes of Stallone or Jean-Claude Van Damme would have made in the 80s or 90s. It even has a couple of explosions that are right out of that era of action movies. So, as you can imagine, the tone is EVERYWHERE in this film; one minute it can be a corny but touching drama about two lost souls coming together to deal with a shared loss, and the next it could have a character being threatened and taken hostage by a pair of rogue gun smugglers, one of which is a corrupt sheriff. It’s a frankly strange mish-mash of so many different films and genres that by no means whatsoever should even go together, and it results in a film that is not so much unbalanced but completely up-sided by the weight of one side over the other. You come out not knowing whether what you just saw was a heavily entertaining mess of a movie, or just a mess. Either way, being completely taken aback by its sudden tonal shift is extremely awkward to watch and unintentionally hilarious; in the middle of a tense action scene, you suddenly get the moment where both boy and dog leap across a chasm in mid-air, played in slow-motion, and though it’s all meant to be taken seriously, you find yourself bursting out laughing at the strangeness of where this corny moment is placed. It’s an astonishingly bad movie, one where you know what you’re watching is pretty rubbish, but you’re so mesmerised at how it completely misses the point it was supposedly setting out to prove. The dog, by the way, is the best actor in the whole movie, and props to its handler and trainer for helping it give a pretty good canine performance. That being said, knowing that the rest of the cast – some of it consisting of actually talented people – is outshined by a dog, that says quite a bit about their performances here; from Thomas Haden Church, recklessly donning a redneck moustache and soap-opera Kuwait backstory, to Lauren Graham who gets next to nothing to do here, except don a Texan accent whilst doing bugger all. The kid actors, for the most part, don’t do anything to stand out, except for Dejon LaQuake as Hispanic teenager Chuy, but for all the wrong reasons. Nothing wrong with the kid’s actual acting, but the way he’s written and directed and even dressed makes him one of the whitest racial stereotypes in a kid’s movie in a long while (in that, he’s a racial stereotype exclusively from the perspective of white writers and directors). Every single sentence he utters seems to include “yo” or “what up” in it like he has Tourette’s, and he’s completely useless in the whole film except to provide “comic relief” even when it’s not that funny to begin with. That’s another thing that they think we expect from a film about a boy and his dog: the racial sensitivities of Jar Jar Binks. The biggest failure of the movie, however, is how it completely side-steps the actual focus on the dogs of war and the actual usefulness they can bring to armed forces worldwide, and throughout history as well. That could have been a much more fitting tribute than what Max ended up being, and it’s quite sad to see those good intentions wasted on a gun-smuggling sub-plot and a racist Hispanic stereotype. Max suffers from a heavily unbalanced tone, which makes it more unintentionally hilarious than moving, and what should have been the main focus is squandered by a corny and clichéd series of movie plots vying for attention in one single movie.